Condor 606 was born in Big Sur and regularly flies back and forth between there and Pinnacles. Visiting Pinnacles National Park the other day, we were lucky to spot California condors several times. Their wingspan can reach up to 3 m. Their graceful flight is a sight to behold as they ride the warm updrafts of between the pinnacles of rock in the park, with their primary feathers bending up like a conductor’s fingers. Condors are the only remaining members of the genus Gymnogyps, which once contained five species. Four are only known from fossil specimens and went extinct at the end of the Pleistocene (~12,000 years ago), but Gymnogyps once ranged across the Americas. As such, the California condor (Gymnogyps californianus) is a relic species; a survivor of a long but mostly extinct lineage. By 1987, poaching, lead poisoning and habitat destruction had reduced the population to 27 individuals, of which 22 were captured and put into an emergency captive breeding program. In the thirty years since this project began, the population has increased to around 450 individuals. The program was expensive, painstaking and a massive undertaking. To this day, all captive-bred individuals are individually numbered and continually monitored. They even have a very adorable directory on the Pinnacles site where you can look each bird up by its number. We saw #606 and #463, and a couple others from farther away that we couldn’t read. California condors can be distinguished by the much more common turkey vultures by their underwing coloration, with large white patches at the front of the wings. I think that turkey vultures are fun to watch as they fly in circles over the highways searching for roadkill, but when you see a condor fly low over your head, it is awe-inspiring. Even the smaller juveniles have much larger, more pronounced heads than turkey vultures, and seem to fly even more effortlessly with a more gently curving V shape in their wings. We had stopped on the trail to discuss field markings for condors with another hiker when #463 soared over our heads, and we couldn’t help but jump for joy and hug each other at the privilege to see one of the famous condors ourselves. Turkey vulture just checking if we were feeling ok as we sat in the shade. As an advocate for invertebrate conservation, I have been known to unfairly poke fun at the human tendency to focus on large, charismatic megafauna for conservation as opposed to smaller and less exciting species that may make up more of an ecosystem’s biomass, or represent a more important link in the local food chain. Pandas have used up billions of conservation dollars, yet they are kind of an evolutionary oddball with their poorly evolved guts that can barely digest their chosen bamboo food, and their infamous failure to successfully mate. Koalas have a similar story. We reformed tuna fishing not out of concern for the fish, but because of concern for dolphins getting mistakenly caught. We tend to put a lot of time and effort into conserving species that we consider cute, or cool, or awe-inspiring. The condors are important decomposers of carcasses, ranging over huge distances in their search for food and efficiently returning the nutrients of dead animals back to the ecosystem. But the public outcry motivating their rescue was greatly helped by the fact that these creatures are incredibly impressive megafauna. If the turkey vulture was critically endangered, it might not get the same funding supporting its conservation. This condor was very far away, gracefully circling the canyon. But looking at the condors, my skepticism melted away and I was left with only gratitude that I was able to witness the grandeur of these beasts as they soared through the air; gratitude that I was able to see them myself and not only read about them in a book. I will never see a Steller’s Sea Cow, or a Great Auk, or a thylacine, or a dodo, because they disappeared before we realized what we were doing, and that extinction is a real and irreversible loss. Perhaps Gymnogyps won’t be around in 10,000 years. Their lineage originally evolved to feed on the giant carcasses from a collection of North American megafauna that is believed to have been hunted to death by humans (though that is a topic of endless debate). But if we hadn’t intervened to save the condors, we would have had to live with the guilt of knowing that we as a species committed the killing blow and did nothing to stop when we knew the reality of our crime. Instead we went to extreme lengths to save these unusual and majestic creatures because we feel empathy for them. As I watched condor 463 soar over my head, I felt relief, and pride, and hope. Success stories are important motivators for conservation, and I couldn’t help but think his wings were spelling out a “V” for victory as he flew away. UC Santa Cruz, like all UC schools, is in the midst of a massive regent-mandated effort to increase enrollment. In the face of a governor hostile to the idea of investing in education (despite his prior promises), the regents have decided that we are going to grow our way out of the budget shortfall. Much has been said about the foolishness of this plan from the standpoint of housing, student tuition and access to resources, but I thought I’d talk about the cost it has had on me personally as a Teaching Assistant (TA). TAs are usually graduate students working on a doctorate or master’s degree. We are paid 50% wages on the assumption we spend 20 hours a week working on TA stuff to support our other 20 hours (ha!) of work a week on our thesis and classes. Our tuition is waived and we receive health benefits. In the last two years, my department’s academic division has been cutting TAships while pressuring the department to enroll more students. For four years, I’ve been teaching the lab section for Environmental Geology (EART 20), which has given me a natural laboratory to note the impact that increased class size has had on my instruction. I’d also note that my experience has been less extreme than other TA’s because EART 20’s enrollment has been flat overall during the time I’ve taught. But the lab section has doubled in size from 22 to 45 students, possibly because we have more majors declaring and they need the lab credit for their degree. As a TA, I am supposed to only spend 20 hours a week on instruction. I’m literally not allowed by my union to spend more time than that. And fortunately, because I have been able to slowly tweak my lesson plans over many years, I now have a lot less prep time than I did when I started teaching this class. The lesson plans are already put together, and I can just focus on polishing and perfecting the lessons. However, the time I need to grade has ballooned to at least double what it used to be. I say at least double, because I usually get tired after the 30th lab and start to slow down. My detail in grading is also impacted because I cannot spend as much time looking and commenting on each student’s assignment. So while they’re paying higher tuition than their compatriots from four years ago, they are getting less instructor time dedicated to feedback on their work. Note that our department has tried to make up for this by hiring graders to assist TAs, but I insist on grading my own labs because I need to understand how students are learning and responding to my assigned material. Our building used to have large, luxurious desks perfect for specimen-rich lab sections. But they unfortunately couldn’t fit more than 20 students in a room with those so they have put in smaller, flimsy desks to stuff more students in. These desks are narrow and crammed together to allow up to 30 students in the room. As a lab instructor, I prefer to walk around and answer student questions looking at the specimen we’re talking about until they understand and have that light-bulb moment. But I can’t do that anymore because the desks are so close together. So instead I now sit at the front of the room and they come up to me. I hate this and I know I get less questions than I would if I could walk around. It is another way that they aren’t getting their money’s worth. The UC claims to be a big cheerleader for the active learning style of teaching. Active learning is different than the classic lecture-based format in that exercises are designed to maximize student participation and interactivity between the student and instructor, hopefully leading to learning by experience rather than example. But active learning requires more grading time and a different classroom layout than the classic lecture format. And I have had to revise my labs over the years to reduce interactivity out of necessity. In the past, I’ve made a landscape out of play-dough for students to map out topographic profiles. This year, there were just too many students for it to work. They scrunched together around the model, with some deciding to wait until my office hours to get time doing it. It was sad to watch this. Next time, I’ll make two models to space through the room so it isn’t so claustrophobic. These problems are only going to get worse, as our department is currently under pressure to increase enrollment and has less TAships to offer every year. We are often criticized for our low student to instructor ratio! Yet tuition is increasing. Students are getting less value for the same course offered four years ago. I’ve observed it with my own eyes. I feel a pang of sadness each lab section seeing the ways it reduces the quality of instruction. I spend more time to try to lessen the impact of these creeping changes, but something’s got to give. I hope Californians realize that the value of our legendary UC schools is under attack. I hope we invest more into education and don’t forget that the UCs helped make our state great. I hope Jerry Brown cements his legacy by increasing UC funding. Some of you may be aware that I harbor great affection for hermit crabs. I own terrestrial Caribbean hermits. Your mental image of hermits may feature a wardrobe of gastropod (snail) shells, which are by far the most common mollusk contractor they use to construct their homes, but as I’ve discussed, they actually have great flexibility in their choice of abode. It turns out that there is yet another option which hermits take advantage of as a mobile home: the flat shells of bivalves and limpets! Porcellanopagurus nihonkaiensis is a species of marine hermit found off the coast of Japan. It uses the relatively flat, unenclosed shells of clams (and also limpets) for protection. 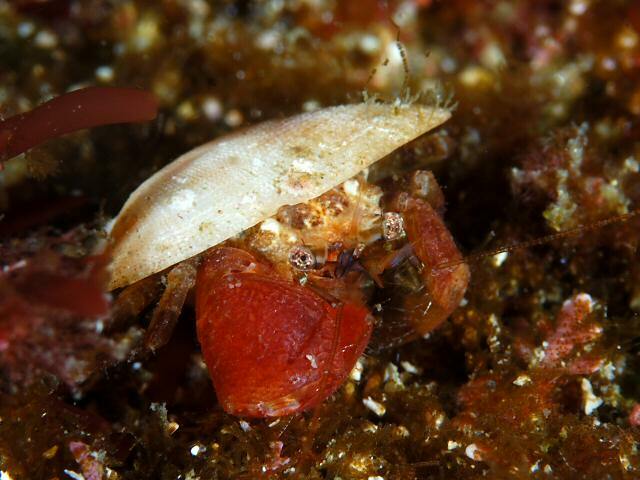 Though lacking the 360 degree protection afforded by a snail shell, bivalve shell valves can be more plentiful in the marine environment, and being able to utilize a different shell frees them from competition with other hermit species which are specialized to work with snail shells. Hermits typically have a long, soft coiled body which fits in where the snail’s body once was, using “uropodal endopods” (little feet at the end of their bodies) to hold themselves in the shell. Some species like Porcellanopagurus, however hold a bivalve or limpet shell on their backs, which still provides protective cover for their bodies. One recent study talked about their method of acquiring and holding the shell. They actually took a cute little series of pictures showing how the crab picks up a shell it with its front claws, places it on its back and then holds it in place with their fourth pair of legs. So now I’ve found a creature that combines my beloved clams and hermit crabs in one fun package. Gonna have to keep an eye out if I ever dive off of Japan!